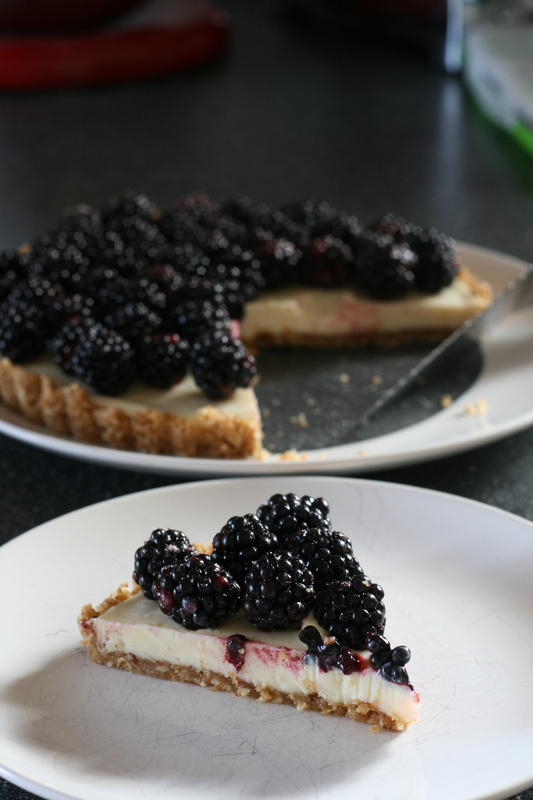 Lime Blackberry Tart – Carbs & Fiber. In the end I Googled “lime blackberry dessert” and came up with this lime and blackberry tart. I love tarts because they are actually very easy to make. When I made the salted caramel tart for Thanksgiving I was surprised how easy it was; it’s really due to the genius of the tart pan (mine is a Wilton with a removable bottom). They can be time consuming because you usually have to make, bake and cool the crust before filling it, and you’ll probably need to chill the finished tart before you can serve it. But with a bit of planning you’ll end up with a really pretty dessert that wasn’t super hard to make. I settled on the Sweet Life Kitchen recipe because while I didn’t have enough eggs to make proper lime curd, I did have two cans of sweetened condensed milk. Nevertheless I still had to make some changes to the recipe. My first challenge was the crust, which uses graham crackers; I didn’t have any of those but I did have 6 or 7 Burton’s Digestive biscuits, which I pulverized in the mini-processor. That left me about 1/4 cup short of crumbs for the crust. I considered pretzels, but we didn’t have any; I also entertained the idea of Rice Chex or Vanilla Chex but I thought they might get soggy too easily when I added the melted butter. I did have a box of Kashi snack crackers but they contained onion powder, and a taste test confirmed that they would be a very bad idea indeed (had they been honey wheat crackers I might have been in luck). I ended up pulverizing the remains of a bag of sliced almonds, which gave me just enough crumbs and would lend a nice taste to the finished crust. With the crust in the oven I tackled the next problem: how to sub out 1/2 cup of sour cream for the filling. This was much more easily solved, because I had a package of cream cheese with no particular purpose in life. Into the bowl it went with the condensed milk, lime juice, lime zest and sugar. This only required 16 total minutes in the oven and a couple of hours to chill. When I sliced it (we took a couple of pieces to hear an outdoor concert), it held together beautifully. I ended up with about twice the filling I really needed—so depending on the size of your tart pan, you’ll want to make sure you have enough crust to push it all the way up the fluted sides of the pan. That way you can make use of more of the filling. Or you could just make two! Preheat oven to 350. Grease a tart pan with butter and set aside on a baking sheet. 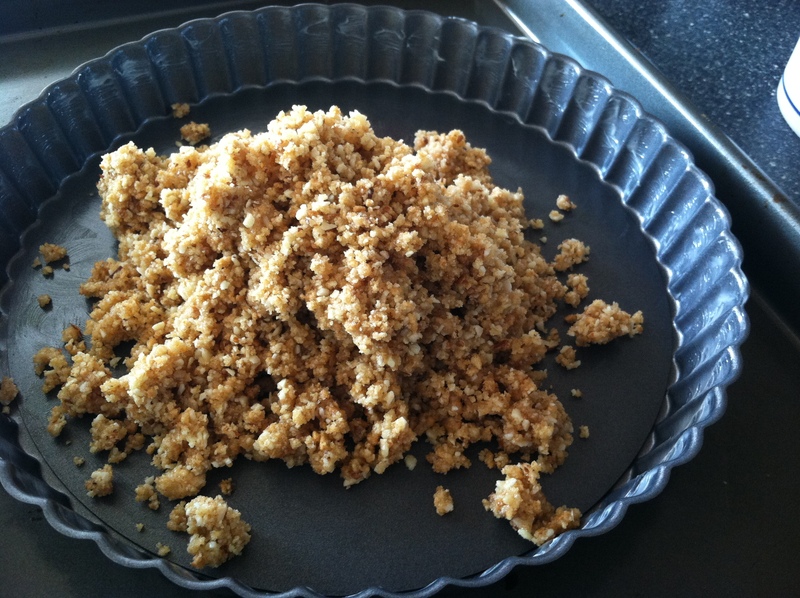 Mix the crumbs, sugars and melted butter in a bowl, evenly moistening the crumbs and sugar. 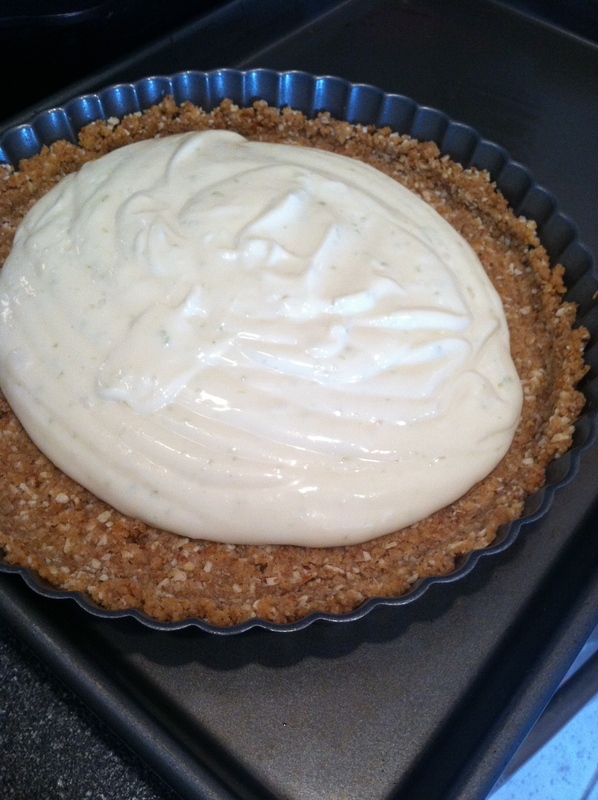 Pour crust mixture into the tart pan and press the crumbs against the bottom and up along the sides. I use the bottom of a pint glass to roll along the sides and push the crust more firmly into the flutes. Bake crust for 8 minutes. Remove from oven and let cool. 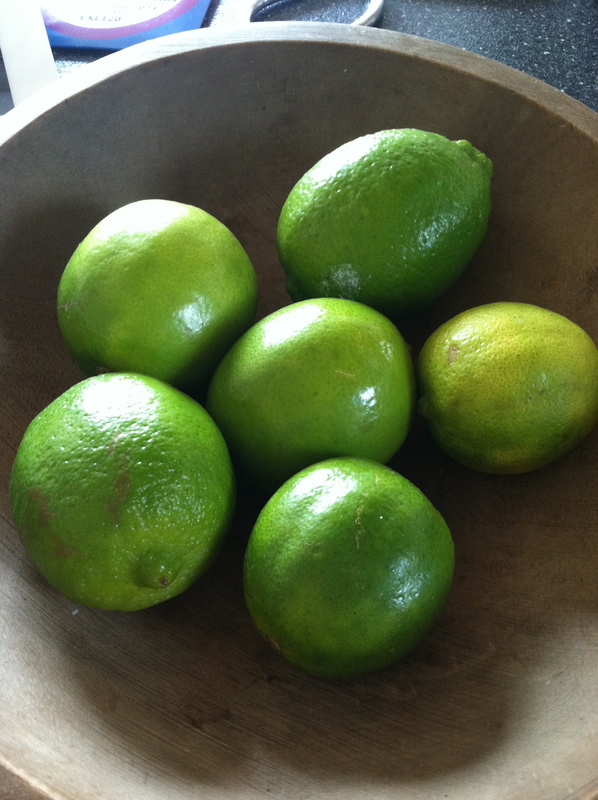 In a bowl, mix the lime juice, sweetened condensed milk, lime zest, cream cheese and sugar in a medium bowl with a hand mixer (or stand mixer with whisk attachment). 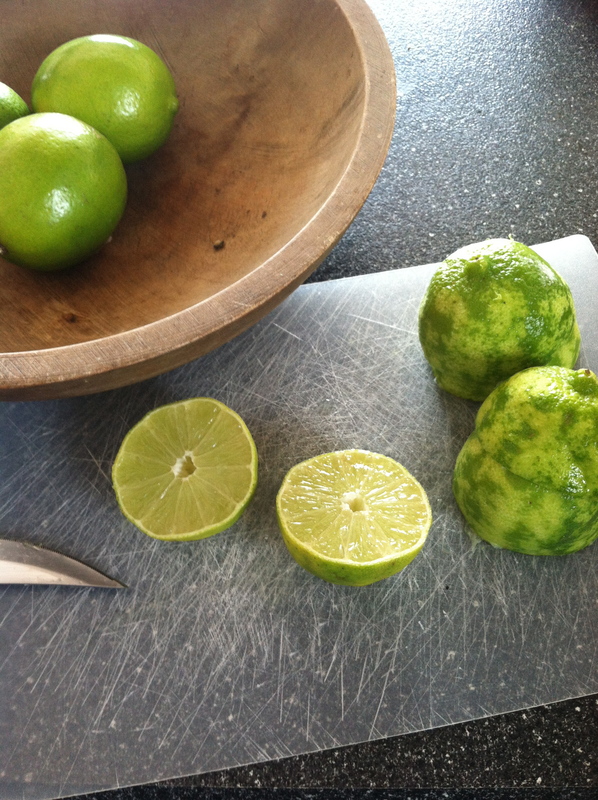 When it is fully blended, pour the lime filling into cooled pie crust. Bake at 350 for about 8 minutes, but do nor allow the top to brown. Cool to room temperature and gently place cling film over the top so the filling doesn’t form a skin. Refrigerate for 1-2 hours or until chilled thoroughly. In a small bowl, toss the blackberries with a few teaspoons of sugar. Press up on the bottom of the tart pan to remove it from the fluted edge piece and place the tart on a serving plate. Arrange the berries on top of the chilled tart. Small pieces will serve 10-12 people, larger pieces 6-8 people. Previous Another meal planning update. Next Ice cream sandwich experiment.